Newly Refurbished Two-room apartment located in one of the most prestigious areas of St. Petersburg, Nevsky Prospect (Nevsky and M. Morskaya str.). 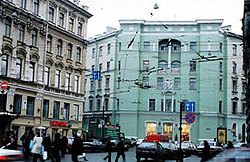 Enjoy St. Petersburg while staying in the prestigious “city center”. You will find numerous attractions, shops, cafes, and restaurants within a short walking distance of the apartment. There is a 24-hour large market across the street as well as a McDonalds and KFC for those of you craving something more familiar. The Hermitage and St. Isaac's Cathedral are both only a short walk away! This highly valued central location affords you easy access to other parts of the city via taxis or the subway (metro), which is only a short walk. 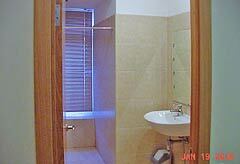 Beautifully refurbished bathroom with Spanish tile. 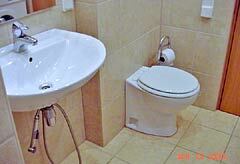 You will find a full shower, toilet, as well as a washing machine. You will even discover the floor of the bathroom (and entrance way) is heated, controlled by a special switch, for your comfort. 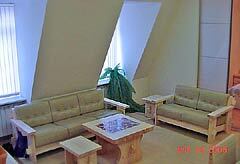 The main room is very spacious, seating 12 comfortably. 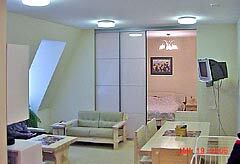 It is furnished very tastefully, with light wood furniture. You will find two large triple pane windows in the front room, which keep the flat insulated from both weather and noise, while inviting in the St. Petersburg sunshine. You will find a satellite TV as well. 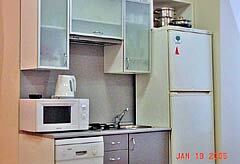 The kitchen was designed to be efficient and easy to use while taking up as little space as possible. You will find a gas stove top and oven, with lighted pull out hood, dishwasher, refrigerator and plenty of cabinet space for all of the pots, pans, dishes, glasses, and utensils. The bedroom is located off the main room. 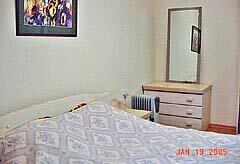 It is very spacious with a comfortable queen size bed, two night stands, a floor to ceiling amour and night table. The bedroom is also very private with sliding floor to ceiling glass doors that closed it off from the rest of the apartment. There is a large closet off the elevated entrance suitable to house all of your luggage bags or other items.